Attendance is especially challenging in a district where the majority of families qualify for free/reduced lunch and the majority of families are immigrants. Cultural differences can lead to a lack of understanding about the importance of daily attendance – not because parents don’t care, but because their life situations are complex and frequently unreliable. As CSBA’s Director-at-Large Asian/Pacific Islander, I would like to share with fellow board members some of Santa Ana Unified School District’s (SAUSD) “lessons learned” related to enhancing school attendance. SAUSD is a large, urban, 99% ethnic majority-minority district where attendance is a critical issue. At SAUSD, we have been working diligently to assist our parents in understanding how to balance life interruptions with school attendance. This can mean not taking their children with them to various appointments during the school day and not travelling out of the country with their children while school is in session. Many of our parents leave their homes very early in the morning as they are domestic/field workers, manual labor or service workers. Frequently, this means that students must get themselves to school. By teaching parents strategies that stress the importance of daily school attendance, the district was able to increase the 2013-2014attendance rate to 96.5%, with 80% of students having an average absence rate of less than nine absences. The strategies SAUSD taught parents included: making arrangements with neighbors to help walk their children to school; having children learn to walk to school with other children; learning how to walk in safe areas (thereby reducing fears of traversing dangerous neighborhoods); teaching children “responsibility skills” to get themselves to school on time; adhering to a consistent, early bedtime schedule to ensure a restful night’s sleep; and starting the day off right by participating in the free breakfast program. Administratively, SAUSD developed a comprehensive system of immediate identification of trigger characteristics that indicate an attendance problem for a particular student. This enables intervention to be instituted immediately. Frequently, a triage or team approach is necessary. Within the district, we have created the Behavioral Emotional Support Team at each school site to address these underlying issues early on by connecting students with resources within the community and within the school. In addition, we embarked on the district-wide implementation of Positive Behavioral Interventions and Supports. We also utilize Attendance Field Workers to make home visits when phone calls are not successful in reaching parents. This integrated approach has proven successful in the reduction of out of school suspensions by 49% and expulsion by 58%. As a District, from 2011-12 to 2013-14, our students gained the equivalent of 9.7 years of instruction! SAUSD also provides incentives for students with excellent enrollment records. Through a generous community partnership effort, our local car dealer, Mr. Bruce Hamlin of Guaranty Chevrolet, donates a new car to a student who has had perfect attendance for the entire year. High school students who have perfect attendance are entered in the drawing for the new car. Posters and presentations at high schools help students strive to be eligible to enter the competition. This year’s winner did not have a driver’s license because her family did not have a car. Now she can attend college with reliable transportation, ensuring her academic success. As a whole, the Santa Ana community is learning the importance of school attendance through a comprehensive, culturally sensitive approach in which school attendance is addressed, recognized and celebrated. Through this approach, we’re reaching our most important stakeholders — parents, students, school sites, and local partners. 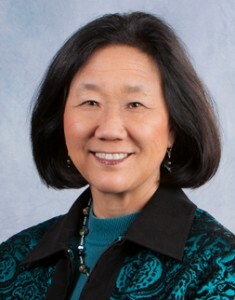 Audrey Yamagata-Noji, Ph.D., is the President of the Santa Ana Unified School District Board and serves as CSBA Director-at-large, Asian Pacific Islander.